Mahogany Road Chocolate is the first and only “made in the Virgin Islands” organic Bean to Bar chocolate! A mile and a half, by road, from the historic town of Frederiksted you’ll find Mahogany Road Chocolate nestled among giant rain-trees, fruit trees, flowers, and historic buildings in the old “village” of Little LaGrange Estate. We’re adjacent to the Nidulari food-truck, and are open Wednesdays 2-6, Saturday and Sunday 11-3. All our ingredients are local to the Caribbean, and we’ll be producing more and more of our own cacao beans here on St Croix, with cacao trees planted under the shade of our existing rainforest canopy. Garden tours and single-estate bars are coming soon; meanwhile, take home a delicious treat of fine chocolate! We’re on facebook too! Like, follow, and share Mahogany Road Chocolate with your friends! Little La Grange (or Lagrange) is an estate situated along Mahogany Road about 1 mile from Frederiksted as the crow flies, and 1.3 miles by road. Originally demarcated as West End Quarter #30 and #33, between 1750 and 1776, it is distinct from Lagrange Estate just to the south. It was combined into one estate by Cornelius Hendriksen, a Dutchman, in 1777, and then had eight other owners, mostly Irish, English or American (including two American ladies from 1803 to 1831), with a steam mill for processing sugar cane being built in 1859. (Some of their names survive in the region today – Kortwright, Stevens, Yard, Finlay, O’Reilly, Logan, Moore, Russel, McDonald…) H. McDonald, the owner from 1884 -1895, grew cane and fruit, but went bankrupt, whereupon the estate was sold to Carl Lawaetz of Moltrup, Denmark, who lived in the great-house currently The Lawaetz Museum, across the road. He sold the machinery and bricks from the various mills on the estate and went about converting it into a dairy and beef ranch. He grew some sugar cane but also sold grass to horse owners in Frederiksted, as well as milk, fruit, and rocks (as building material). His three sons, Frits, Kai and Erik, all well-known on the island, (two being authors of books of local history), inherited in 1945, when much of the estate was sold off. 70 acres and the great-house were then run by Kai, who was born here, and who trained in Denmark as a horticulturist. He produced vegetables, salads, herbs, and many extraordinary varieties of mango and other fruits, as well as his own hybrids of hibiscus and other flowers, over a long career assisted by his wife Irene nee Magras, from the island of St Bartélemy (or St Barts). They remained on the estate despite the loss of the museum roof to Hurricane Hugo in 1989, and its replacement, and built a new house overlooking the valley. Sadly Kai had already passed away when Mandy and Merryn moved here, but ‘Miss Irene’ as she is known to all far and wide, has been a great friend and mentor throughout our life here, along with her daughter and family. Her daughter Suzy kindly corrected and rewrote my impressions for this short history. Irene also introduced Mandy to one of her nephews, Jan, also born on St Croix, who has been her partner for eight years, and is the mainstay of the effort to keep equipment running and the garden from returning to jungle! During all of this period the little estate village which now forms Mahogany Road Chocolate and Nidulari Bakery, was inhabited by many successive waves of agricultural workers, some St Croix born, others from almost every island in the Caribbean, particularly St Kitts, Nevis, St Lucia, and Vieques. I wish I had thought to record every story told to us about those arrivals throughout the 20th Century, there must have been nearly a hundred visitors with tales to tell of this kind, some of whom still return to see us. Many people remember Justo, who lived here all his adult life, alone after his family left, until the last few months of his life – with his scary-to-some eye, his copper skin and long white hair. He was said to disappear into the forest at will, no matter how close to him you passed, and rumours abound of his Taino ancestry and ability with obeah, though he was a kindly person. Although conventional farming may not be practical for us as the current owners, the ‘village’ with its cottages, ruins, huge trees, and varied slopes provides a home for us and all our projects – whether artistic, in construction, in the kitchen, or growing things. We are trying to preserve the feel of the place, which cannot be confined to one historical period or purpose, but which has so strongly all the elements of West Indian life. At any given moment you may be able to see the art studio, buy handcrafts from the relief project Mandy runs in Haiti, order a catered dinner, have brunch or lunch, fill your grocery basket with fresh breads and cakes, soups, sauces, desserts, preserves, vegetables and fruit in season, and of course, chocolate, coffee and nuts roasted right here! St Croix Chaney – and Chocolate Chaney! Between our currently very small harvests of cacao beans from our own mature criollo trees, and while we wait for more of our seedling criolla and trinitario trees to grow, Mahogany Road Chocolate is ‘Bean to Bar’ small batch, artisanal, organic chocolate, made with Fair Trade Haitian Cacao. These cacao beans are harvested, fermented and dried in Northern Haiti in co-operatives with a high percentage of woman farmers, and pay a better rate for the crop than the open market, while supporting the community in education and nutrition. (The beans are also organic, although the farmers cannot afford to go through the certification process). All of our other ingredients are organic, and come from either Haiti or close by in the northern Caribbean. There is cocoa butter from the DR, sugar from Jamaica, vanilla from PR and Haiti, coffee beans from Haiti and DR, and flavourings from our orchard and garden, or from our St Croix neighbours, such as lime and sour orange, ginger, turmeric, sea-salt, chillies, nutmeg, (and ‘wait-and-see’ what flavours are next)! We hope to produce our own cocoa butter in a few year’s time. Once obtained, the cacao beans must be inspected, cleaned, and roasted in batches under close supervision. Then they pass through the first simple hand-made ‘machine’ to de-husk them, forming nibs, or small chunks of beans, from which the husk or chaff is winnowed away. We sell roasted beans and nibs in bags as snacks or ingredients for granola and baking. The chaff and cacao dust can also be brewed as a tea with a pleasant not-too-bitter taste, and the remaining cacao waste is used as plant food, ask for these items at the stall. Nibs are carefully weighed out in exact proportions to begin the grinding process in a ‘melanger’, the stainless steel drum has a granite base that turns against two granite rollers to crush and refine the particles, sometimes for many hours or even days. Sugar is gradually added once all the beans are ground into ‘cocoa liquor’, along with a little cacao butter for smoother texture and mouth feel. By the end of the grinding, a secondary process known as ‘conching’ is also taking place – the particles are gently heated by the grinding and motion, and this dispels any remaining bitterness and grassy flavours, to bring out the richness of the chocolate. Next the batch must be tempered to have the right consistency, and to form glossy bars with a snap when broken – despite the difficulties in our high temperatures and humidity, it can be done! 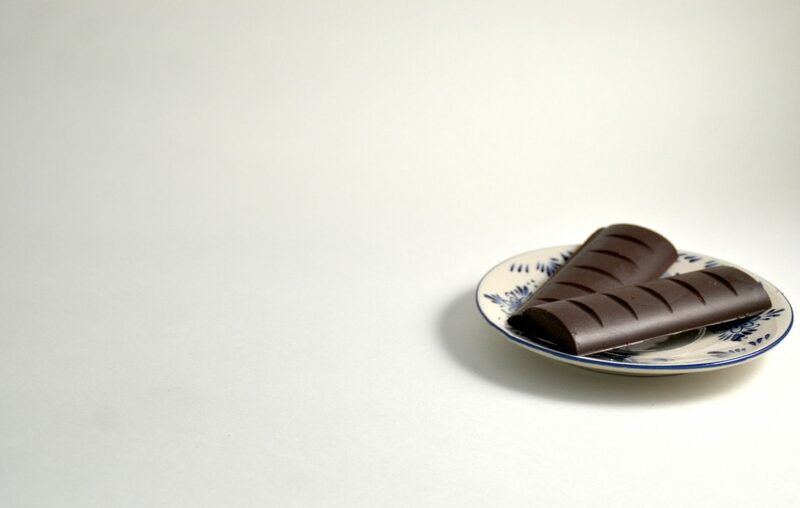 The newly tempered chocolate must be immediately poured into moulds, and allowed to set. Later they will be wrapped and labelled. Coffee is roasted in a similar way in our roaster, and the beans chopped into coarse chunks for addition to our Coffee Bars, with a drop of organic coffee oil. Coarse salt from various salt-pans (St John, BVI or Anguilla) may be sprinkled into the moulds for Sea-salt bars. Almost all of our packaging is paper based and recyclable, or made from recycled materials, and we hope to continually improve upon this. The history of Chocolate goes back 4000 years to the Ancient Maya and Incas, as rich and mysterious as the taste pure criollo and trinitario beans still evoke. Chocolate bars have been around for 170 years – but are constantly being refined and adapted to our palates, and the current tree-to-bar and bean-to-bar movements, along with technical innovations that make production on the cacao-estate possible despite the climate needed to grow the beans, can take your senses to places you never imagined. We aim to make a fine chocolate representative of St Croix, of the Virgin Islands, and of the best ingredients the Caribbean has to offer! Our bars have distinct notes in the roasted spectrum, toasty and a touch of smoky, and in the earthy spectrum with a hint of molasses. You may detect a fruity flavour, perhaps passionfruit or orange peel, a taster even mentioned dried banana, or a nutty sensation. We’d like your opinion so please review our Facebook page! Coffee, which we source from organic Haitian and Dominican Republic Fairtrade farms as available, is roasted in our Behmor roaster for our own use, for the chocolate bars, and for you – we can roast to order, roast your own coffee, and grind if requested. All roasted coffee is fresh within the previous few days, or done to order the same day. We can order green coffee (or cacao) beans for you as well. We are currently roasting US red-skin peanuts in our roaster too – and they are available plain, with Sea Salt, or Candied with Ginger (in the style of the popular street-snack from the island of Grenada). The roasted peanuts are also ground in our melanger to make smooth peanut butter that is really tasty, with sea-salt, and no other ingredients! a cup of our Hot Chocolate on a Stick, coming soon!